Dear Parent/ Guardian…. Someone in your child’s class has lice…. followed by the steps in treating and preventing. You’ve most likely received that note a time or two. I started researching and stumbled across Fairy Tales Rosemary Lice Repel Shampoo, Conditioner and Sprays. Lice had never been an issue for us. I never had it growing up and I sure was going to do whatever it took to prevent it so I ran to my closest Bed, Bath, and Beyond and stocked up. That summer we headed down South to spend time with family. We ran out of our Fairy Tales while we were down there. I couldn’t find it anywhere. When we finally got back to NYC, I decided to finish using the bottles of Shampoo and Conditioner we already home. BIG MISTAKE. That fall we got LICE. Long story short, it was far from a Fairy Tale at first. Through out the combing process, it gave my girls and I more time together to talk about the school day. I learned so much during those combing sessions, it wasn’t all horrible. After that experience, I also started using it for myself and we continue to strive to prevent lice with Fairy Tales. When I received an invite to mix and mingle with Momtrends and Fairy Tales last week, I knew I had to attend to tell them how much I love their products. I also had to share our lice story. I loved learning more about their newly formulated Fairy Tales while mixing cocktails made with some of their all-natural ingrediants. Rosemary Repel Prevention: As I mentioned, this is a necessity during the school year. Not ony is it made with all organic herbs and natural plant extracts, it’s clenically proven to prevent lice. After, my experience I would have to agree. It also smells nice, unlike other lice products. Sun & Swim: We had the chance to use this at the end of last summer. The formula made from natural fruit extracts to heal damamged hair. It left the girls hair smelling so wonderful but also gave a silky, soft texture after they used it. I ended up using it too becuase I loved it. With summer quickly approaching, this is a must in the pool bag. No More Knots: This line contains a natural keritan to calm frizz and tangles. Like other Fairy Tales products it smells so good you will want to use it. We have not tried this line. Fear Lice? Fairy Tales offers lice advice and tutorials at Lice 911 . Discover lice? Fairy Tales offers an at home treatment “Lice Goodbye” for parents to eliminate the pesky bugs at home. . In addition to hair care products, but keeong in the theme of bugs, Fary Tales also has Bad Bugs. Bad Bugs is a natural, chemical free to keep those “bad bugs” away on sunny, summer adventures. Thank you Momtrends and Fairy Tales for a wonderful night. Both of my girls have very sensitive skin. They have had eczema for as long as I can remember. In keeping flare ups down, it’s been extremely important in finding products that don’t have harsh (and toxic) ingredients. Last week I attended a launch for Acure Organics Baby Care, created and tested for sensitive skin. All of the products are NSF or USDA certified organic, made with natural ingredients including food and plant based oils. Baby Buns ($10.99): Most diaper creams are petroleum based which is not good for irritated skin. Essential fatty acids which help with soothing and healing. Not pasty. Wipes off easily. Pediatrician tested on sensitive skin. All Better Balm ($10.99): Perfect for babies and kids with eczema. Used to calm itchy skin, chapped noses and moisturize hands. Mom can also use the All Better Balm on stretch marks. Fix-It-Stick ($7.99): In addition to being used on cuts and scraps, the fix-it-stick can also be used as a lip balm. It contains a blend of pumpkin, borage, and pomegranate oils. Sun SPF 30 Stick ($7.99): With Spring Break and warmer weather on the horizon this will definitely be a staple in our beach bag as well as in my purse for sunny days in the Park. Baby’s Day Out 3-Pack ($15.99): Includes the Fix-It-Stick, the Bug Stick, and the Sun SPF 30 Stick. As my daughters get older and become more independent, I’m finding they like to apply products on their own. When their eczema flare-ups, the like to put cream and lotion on the itchy spots, especially in bed at night when it’s bothering them most. I feel comfortable letting them use all of the Acure Baby Care products on their own because they do not contain toxic chemicals. Thank you Acure Organics for a healthy, safe, effective, and affordable products that are allowing my girls to be more independent. To learn more visit www.acureorganics.com or follow on twitter @acureorganics. Thank you Momtrends and Acure Organics for a wonderful event and introducing a healthier product into our lives. Loved the decorations and centerpieces to go with the super cute Acure Organics Baby sea-life themed packaging. And thank you for these awesome sweet treats! Did you know today is National Cheese Lover’s Day? My two girls absolutely LOVE cheese. To celebrate Chuck E. Cheese is giving away a guest pass to one lucky reader (details at the end of post. We are big fans of Chuck E. Cheese. It’s always great adventure and a blast for my girls. With the cold winter days here, Chuck E. Cheese is a fabulous indoor activity to let the kids burn off energy, going from one game to another. We just went on Martin Luther King Day with friends and all the kids left asking when we could go back. 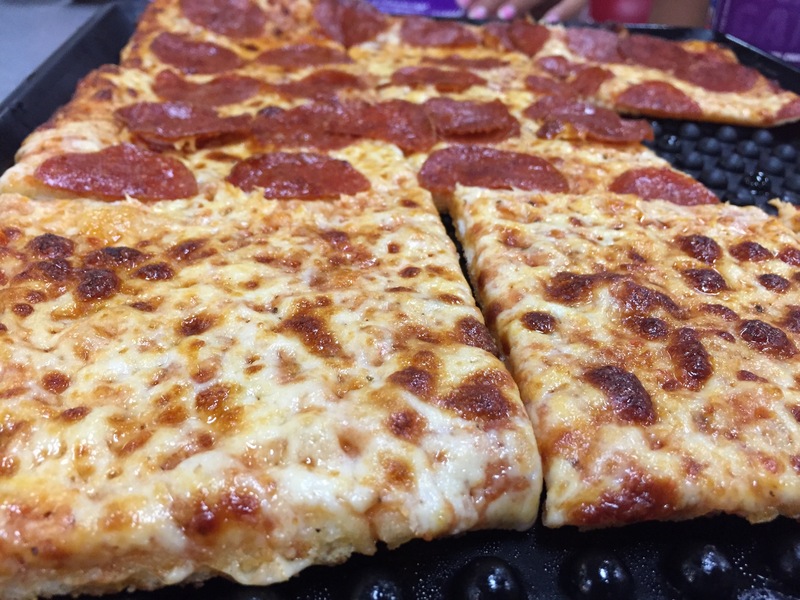 From dancing with Chuck E Cheese to munching on delicious cheese pizza, we’ve had some cheesy moments at Chuck E Cheese and can’t wait to have more. Share your Cheesiest Family Moments, stories or pictures, below in the comments and/ on social media channels. Please comment with a link your social media account as well. Giveaway Ends February 3rd at 12:00 am EST! Good luck! For the past 6 1/2 years I haven’t been able to cook with nuts or have them in my house. When my oldest daughter turned 1, she had a reaction to peanuts. The thought of nuts in the house was extremely stressful. Recently, we found out that she is one of the 20% to outgrow her food allergy. It’s been challenging getting her to try different foods with nuts, after so long of telling her they would hurt her, but I can now cook with and eat nuts at home in ease. With the most recent discovery, I was excited to join Momtrends and Wonderful Pistachios for a night of cooking and mingling at My Cooking Party. It was fun night catching up with friends while working together to put together a delicious meal from appetizers to dessert, all having pistachios as an ingredient. A fresh summer salad with the crunch of Wonderful Pistachios and delicious peaches. 1. Bring 2 cups water to a boil in a medium saucepan. Stir in barley, reduce to a simmer, and cover. Cook about 45 minutes, until barley is tender and water is absorbed. Remove from heat, and set aside 10 minutes. Add parsley, fluff barley with a fork and set aside. 2. Meanwhile, bring water to a boil in another saucepan; boil string beans about 5 minutes, until crisp and tender. Blanch in ice water and set aside. 3. In a large bowl, whisk pistachio oil, lemon juice, salt and pepper; toss with arugula, string beans, and half the sliced peaches. Pistachios, apples and onions are stuffed in this impressive, but easy main course. A nutty Wonderful Pistachio pesto is the perfect accompaniment. 1. To make the pesto, place spinach, pistachios, garlic, salt and pepper in the bowl of a food processor. Slowly pour in oil, while machine is running, about 20 seconds. Pulse to completely combine. Set aside in the refrigerator, up to one day ahead. 2. To make turkey roulade, position oven rack in the center and heat oven to 375°F. Place cranberries in a small bowl and cover with boiling water. Let sit for 5 minutes until softened. Drain and set aside. 3. Meanwhile, heat 1 tablespoon of oil in a medium skillet on medium heat. Add onion and cook 5 to 7 minutes until softened. Add apple; continue to cook, 5 to 7 minutes, until onion and apples are golden. Add ½ cup chicken broth, thyme, rosemary, ½ teaspoon salt and ¼ teaspoons pepper, and simmer. Stirring occasionally and scraping up any bits that stick to the bottom of the pan, about 5 minutes, until broth is absorbed and apples are softened. Transfer to a large bowl. 4. Add bread and cranberries to apples and stir to combine. Pour in ⅓ cup chicken broth and stir to combine. Add additional 2 tablespoons chicken broth, as needed, until bread is moist, but not wet. Stir in pistachios and set aside to cool. 5. Place turkey between sheets of plastic wrap, and pound with a meat mallet or rolling pin, to about ½-inch thick. Season each side with remaining ¼ teaspoons salt and ¼ teaspoons pepper. Place turkey, skinned side down on working surface. Spread stuffing over turkey leaving a border uncovered, about 1½-inches all around. Roll up and secure tightly with kitchen twine. 6. Heat a roasting pan (or large skillet), with 2 tablespoons olive oil, on medium to medium-high heat. Brown turkey roulade on all sides, 12 to 15 minutes. Set aside on a plate. Add wire rack to roasting pan and place turkey on rack. Combine onion wedges in a bowl with 1 tablespoons oil and place in roasting pan alongside turkey. Add ½ cup chicken broth to roasting pan and place in oven. 7. Cook for 1 hour and 15 minutes, until turkey temperature reaches 165°F. Remove from oven, transfer to a cutting board and tent with foil. Allow to rest 10 to 15 minutes, until juices have had time to absorb, before cutting into 6 to 8 slices. 8. Meanwhile, add remaining chicken broth (about ½ cup) to roasting pan, and scrape up any bits with a wooden spoon. Serve pan drippings alongside turkey with pistachio pesto. Sweet roasted potato wedges get the holiday treatment with crunchy Wonderful Pistachios, tangy goat cheese and a lovely pomegranate glaze. 1. Preheat oven to 425°F and line two baking sheets with aluminum foil. 2. Toss potato wedges with olive oil, salt and pepper, mixing thoroughly. Transfer the wedges to the baking sheets making sure they spaced evenly. 3. Bake for 15 minutes. Stir wedges and rotate pans. Bake another 10 minutes until cooked through and caramelized. Remove from the oven. 4. Combine the honey and the POM Wonderful pomegranate juice. Heat for 30 seconds in the microwave and stir. Arrange the sweet potatoes on a platter and scatter the Wonderful Pistachios and goat cheese over them. Drizzle the pomegranate glaze over all. Serve. In addition to amazing food, the space was absolutely stunning. Momtrends did a wonderful job creating a gorgeous winter white tablescape using pistachios, beautiful Teleflora centerpieces, lighted tress from target and a gold specked table runner from Minted. They also used Wonderful Pistachios with candles and created a keepsake ornament place setting filled with pistachio shells. The simple yet beautiful accents added a special touch to the delicious meal, perfect for entertaining this Holiday season. Have a wonderful Holiday and a Happy & Healthy New Year! Happy Cooking! Disclaimer: I received a gift bag from this event as well as compensation for this post however this did not alter my opinions. It was a wonderful night and the food was delicious. Thank you to Momtrends, Wonderful Pistacios and My Cooking Party. Looking forward to making these recipes again for family this Holiday season! It’s the most wonderful time of year when our elf, Snowflake, returns. The girls light up and look forward to waking up to see where she decides to hide. On occasion, she has been known to leave a gift or two when they’ve been extra good. Recently, Snowflake left them a gorgeous Teleflora Peanuts arrangement and delicious Matthews 1812 House desserts. Snowflake must have known that I had holiday entertaining on my mind. The beautiful arrangement from Teleflora is placed in a fun and festive Peanuts cookie jar. Once the flowers are gone, the jar can be used for cookies at the next Holiday gathering and for many years after. Teleflora also has many other gift options that are perfect for any occasion. I’ve ordered many times and they’ve always been prompt, fresh, and beautiful. They can transform a room and brighten a day. Perfect for “sending cheer” this Holiday Season. Matthews 1812 House has delicious desserts for gatherings. Snowflake brought us the 1812 Bar and Fruit Filled Cookies. At our most recent Holiday Movie Night Gathering, we brought the 1812 Bar. It is made with apricots, pecan, and chocolate chips mixed with batter, on top of a shortbread crust, finished with a browned butter frosting. My daughter, who we recently found out was one of the 20% to outgrow her nut allergy, loved it. I didn’t mention there were nuts in it and she didn’t taste them because after 6 1/12 years of being nut free, it’s been hard to tell her she can eat them. The adults loved it too. It was definitely a sweet treat to share with our group of friends. We also had the opportunity to try the Matthews 1812 House Fruit Filled Cookies. The apricot, peach, strawberry, and raspberry cookies were absolutely delicious. We moved our Teleflora arrangement to another vase because the girls were anxious to put the cookies in the cookie jar for an ornament decorating party with friends. The cookies were gone in a flash. Teleflora and Matthews 1812 House were a huge hit for our family. They are perfect for entertaining this season and make the perfect gift for teacher, friends or family. Wishing you a wonderful Holiday Season filled with cheer! To learn more about Teleflora, click here. To learn more about Matthews 1812 House, click here. Be sure to follow them on Facebook. Disclaimer: I did not receive compensation for this post. All opinions expressed are my own. I received samples for review however this did not alter my opinions. Thank you Teleflora for “sending cheer” to my girls and to Matthews 1812 for adding some extra sweetness to our Holidays. The Nanny League provided childcare for the event. My daughter had a blast with them creating crafts and playing games. Cabi Clothing showcased some of their winter tips and shared some Holiday trends for this season. They have everything you need for your Holiday party to a cozy weekend by the fire. Teleflora always amazes me with their gorgeous arrangements that come in cookie jars, coffee mugs, and more that can be used and cherished when you have to say farewell to the flowers. New for the Holiday season is the adorable Peanuts Collection arrangements. A great gift for family, friends, or teachers. Also the perfect centerpiece for your Holiday party or gathering. PomWonderful sampled many great appetizers, cocktails, using pomegranate perfect for Holiday gatherings. I loved how they added pomegranate seeds to guacamole and created a delicious pomojito with PomWonderful juice. Pomegranate adds texture, flavor, and a festive color. You can find some great recipes here. Add a festive flare by decorating Pomegranate juice bottles to use as a place setting or as an activity to keep the kids busy at your Holiday gatherings. My daughter made a snowman with the Nanny League while I attended the event (featured above). Tessemae’s comes from a family recipe keeping “clean eating” in mind. Their dressing, mustard and dips are delicious and a great add to your Holiday meal. As of December they will be USDA organic. Igloo has everything you need to keep your Holiday beverages and food cool. In addition to being perfect for Holiday gatherings, they have many great products that make fabulous gifts. I loved the new monogramed water bottles. During the Holidays and on chilly nights, we love having family game night. Hasbro showcased many fun games for the entire family. Some of our favorites include Twister, Monopoly, Operation, Elefun & Friends Hungry, Hungry Hippo and Jenga. Games also make fabulous gifts the entire family can enjoy. American Girl makes my girls wish list every year. They are great gifts because they can be passed down and cherished for a lifetime. Showcased at Momtrends was the 2015 Girl of the Year Grace (at the top of my daughters list this year) and the newest BeForever Doll, MaryEllen. Their new Mother/ Daughter Advice Collection would also make a fabulous gift. Mudpuppy has many great gift ideas from unique books like So Many Stars Andy Warhol to craft kids and gorgeous puzzles. I loved the Bag Tags too. They are a perfect stocking stuffer and can be used for your Holiday travels. I See Me Personalized Books have been a favorite for gifts in the past. I love their Holiday books as well as their new It’s Fancy To Be… book. The perfect gift to get kids engaged and encourage reading. Bedgear, performance bedding, has a wide selection of sheets, pillows, and mattress protectors for kids and adults. They are super soft and look incredibly comfortable. These backrests would also make a perfect gift for kids who like to sit on the floor and play games or read in bed. I can’t even tell you how many time we run out of ink printing photos, worksheets and coloring pages. Epson Printers has the new Expression 2550 printer in which the ink will last for up to 2 years, equivalent to 26 cartridges. In a bind for wrapping paper? Simply go to the Epson Wrapping Generator and create a personalized print for a loved one. Have a Happy & Healthy Holiday Season to all! Disclosure: I received a gift bag for attending this event however, as always, all opinions expressed are my own. Thank you Momtrends for another fabulous Holiday soiree and to all the sponsors who shared many fabulous gift ideas for the season. My husband has asked me on several occasions, at what age will our girls stop wanting us. While our girls are only 7 & 5, each year seems to go by faster and faster. They are growing up too quickly and before we know it that time will be here. There are many challenges and life-lessons that come with growing up, especially for girls. Navigating social circles, understanding puberty and the changes your body goes through, the ever-changing emotions and hormones, learning from mistakes made along the way, and now social media and cyber-bullying. All of this can impact the relationships between moms and daughters. Not long ago I took my oldest daughter for a special day out at the American Girl store. 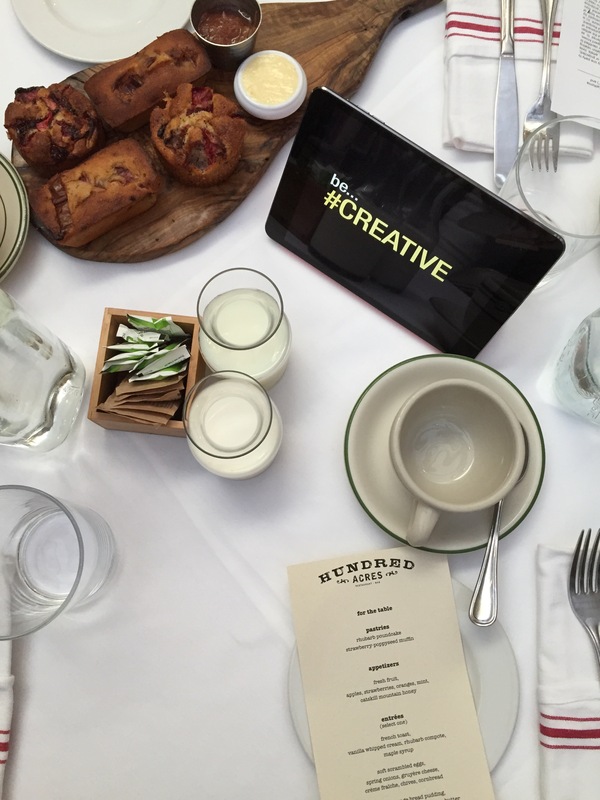 We started the morning with a breakfast hosted by Momtrends and American Girl. We joined Dr. Cara Natterson, best-selling author of the American Girl advice collection, The Care and Keeping of Us in a discussion about raising girls and keeping the spark in the relationship between Mom’s and Daughters. Delay Social Media as long as possible. Discuss tough subjects on long car rides or at night when the lights go off. Your child might be more willing to open up. 12 seems to be the magic number in which girls start finding friendships more important. Let your child fail and make mistakes. If they don’t bring their homework to school or study for their test, they will learn that they need to do it next time. Dad’s should be involved with their daughters. The Care and Keeping of us could be a great resources for dad’s to use. When it comes to friendships you think might not be positive for your daughter, use subtle steering. “Hold a Mirror” and talk about what’s happening. Second grade is especially hard. It’s the beginning of social shifts and “resorting”. A good resource could be the American Girl Friendship Book. The Care & Keeping of Us: A Sharing Collection for Girls and Their Moms is a 3-book set to keep lines of communication open for girls and Moms. The collection includes The Care & Keeping of Us: A How-To-Say-It Book for Girls, The Care & Keeping of Us: A How-To-Say-It Book for Moms, and The Care & Keeping of Us: A Book for Girls and Their Moms to Share. My daughter was so excited to look through the book. It has many conversation starters for difficult topics and activities to work on together. It will be a good resource for both of my girls as they grow. After our wonderful discussion, my daughter was able to explore the store. We took her doll for Salon Services, checked out the beautiful holiday displays, and put together her Holiday wish list. One thing I from that day was how important it is to spend time with each of my daughters, individually. We had a wonderful day. I am looking forward to sharing many more adventures together and working on our Sharing Collection together. Disclaimer: I received a gift bag for attending the event however this did not alter my opinions. All opinions expressed are my own. Thank you Momtrends, American Girl, and Dr. Cara Natterson for a wonderful morning. Chuck E Cheese brings back many memories as a child. I had birthday parties there and it was a place I always wanted to go. But when I became a parent for some reason the thought seemed daunting and an adventure I didn’t want to take. I let their grandparents on many occasions when we visited them in Virginia. I never told them there was a location in New York. They thought it was a special place they could only go to down South. Until we went for a birthday party. That’s when I realized that it wasn’t that bad after all and a relatively easy adventure to take from the city. 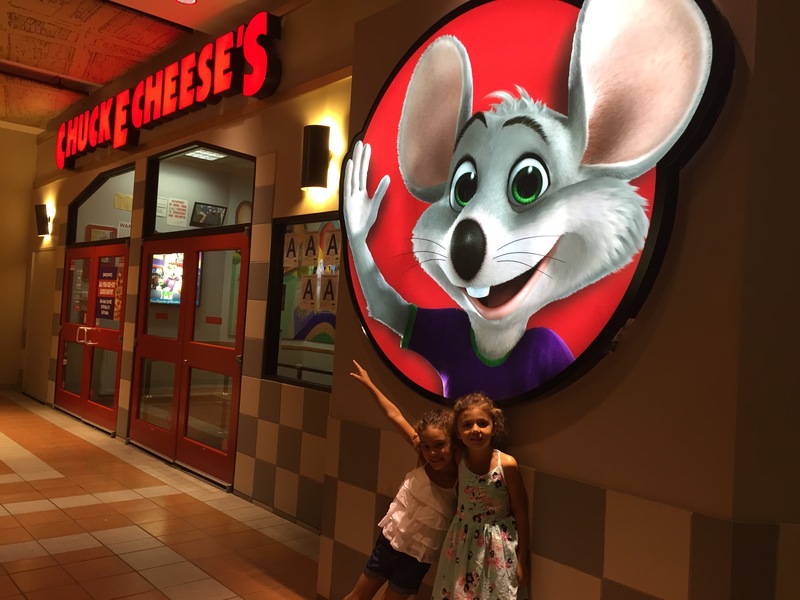 Not long ago my girls and I had the pleasure of taking a trip to Chuck E Cheese at Atlantic Terminal in Brooklyn again. 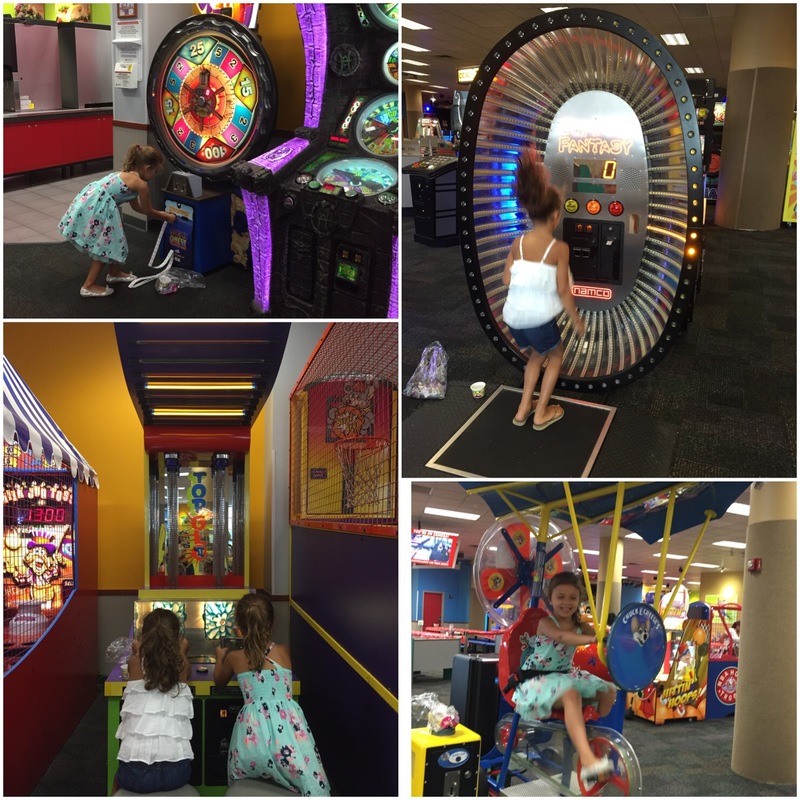 Every time they visit a Chuck E Cheese, my girls have a blast! They are eager to try every game and on a mission to get as many tickets as possible to earn a fabulous prize upon exiting. The staff. They were extremely friendly and helpful, especially during times tokens were eaten by the machine. They were there to help and fix the problem. Safety: Upon entering, all Chuck E Cheese locations have this policy, adults and children are given a stamp. To exit with a child, the adult and child’s stamp must match under a black light. They stick to this policy because I have asked a parent to bring my daughter home from a party taking place at the Brooklyn location. I left a little early to run errands. Luckily, I was still nearby when they were leaving because she wasn’t able to leave with her. 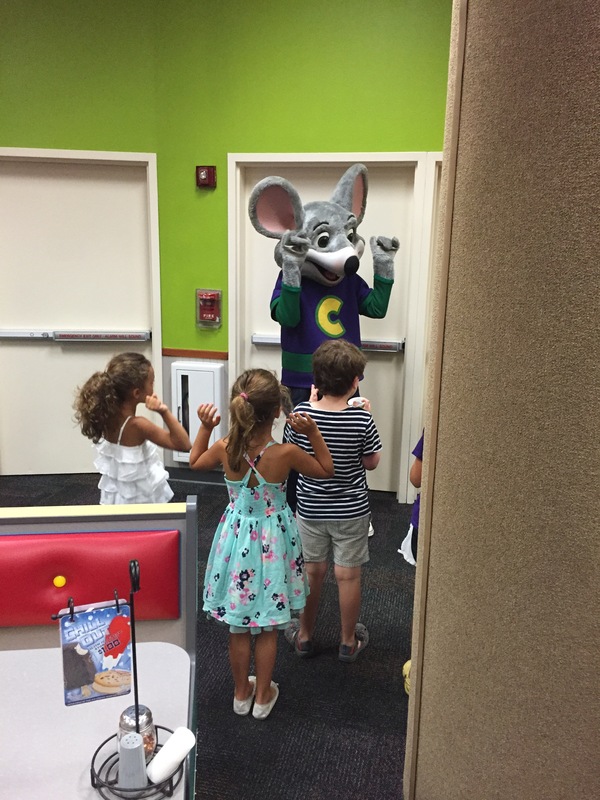 Every so often Chuck E comes out to do a dance with the children. After tickets are thrown all over for kids to get. I’ve never really liked this because on crowded days kids can get trampled on and the older kids wind up taking all the tickets. During our most recent visit, it was the first time tickets weren’t thrown all over the ground for kids to jump and scurry around for after dancing with Chuck E Cheese. Every child stood in line. If they danced, they received a handful tickets. It saved me drying tears from my younger daughters face when the bigger kids jumped in and scooped them all up and a much safer option to avoid someone getting hurt. The food: Chuck E Cheese has added new items to their menu. In the past, I haven’t been inclined to eat there. I always went, played games and left. As part of our visit we got a VIP tour of the kitchen to see how their thin and crispy pepperoni pizza is made. I had no idea that Chuck E Cheese uses fresh ingredients on their menu. Every day, they shred a block of mozzarella. Three times a week they make dough, fresh, in their kitchen. 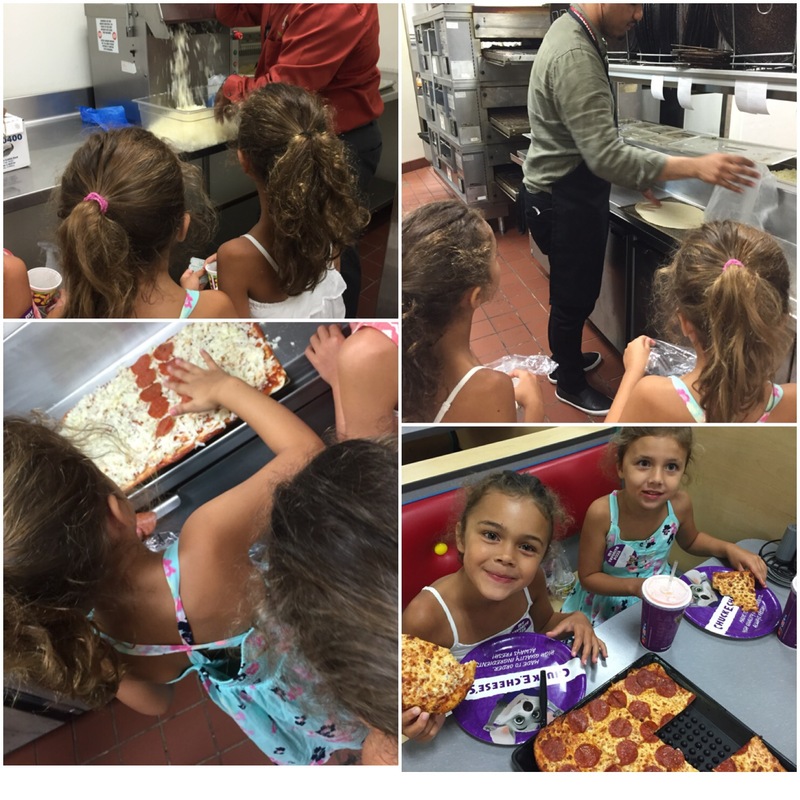 During our visit, we had the opportunity to try the pepperoni pizza we helped them make while learning about the process. Normally my girls only eat cheese, so they were kind to make half cheese and half pepperoni but since we were there to try it they had to have a taste. They LOVED it. It wasn’t too spicy and it had a nice flavor. On our next visit, we will definitely be ordering lunch/dinner while we are there and are excited to try some of the new items on the menu. With chillier days ahead, Chick E Cheese is fun, exciting, and a fabulous adventure. The best times to go are early, when it first opens and on weekdays (check hours, as times vary at different locations). 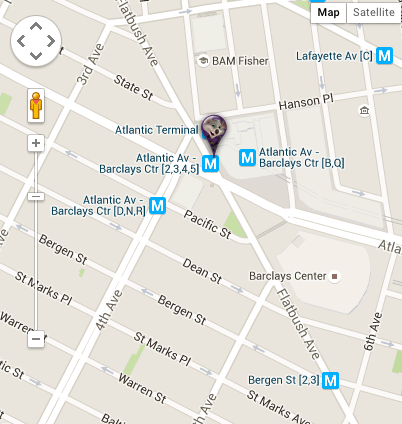 To get to the Brooklyn location by train take the 2,3, 4, 5, D, N, R, B or Q trains to the Atlantic Avenue/ Barclays Stop. It is in the Atlantic Terminal Shopping Center. Not in NYC, find a location near you. Disclaimer: I received a guest pass including food and tokens for this review. It did not alter my opinions. We had a blast and it will definitely be an adventure we take many times as the weather gets colder. Thank you Atlantic Avenue for a fun afternoon adventure. The GB Qbit made it’s official release in July. We had the chance to try it out. As you can imagine, city-life requires a lot of walking. I average 7 miles a day. 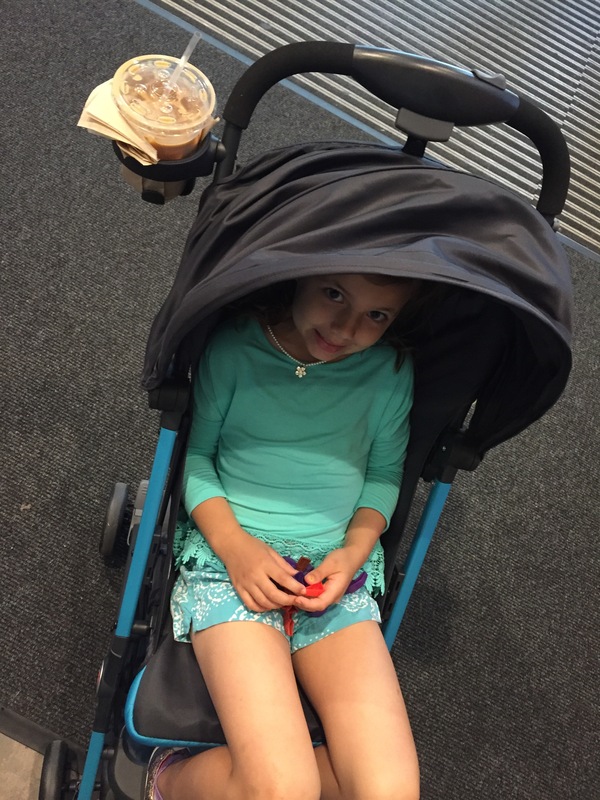 A lot for a young child which is why I rely on a stroller to get my youngest around. Space is few and far between in NYC. 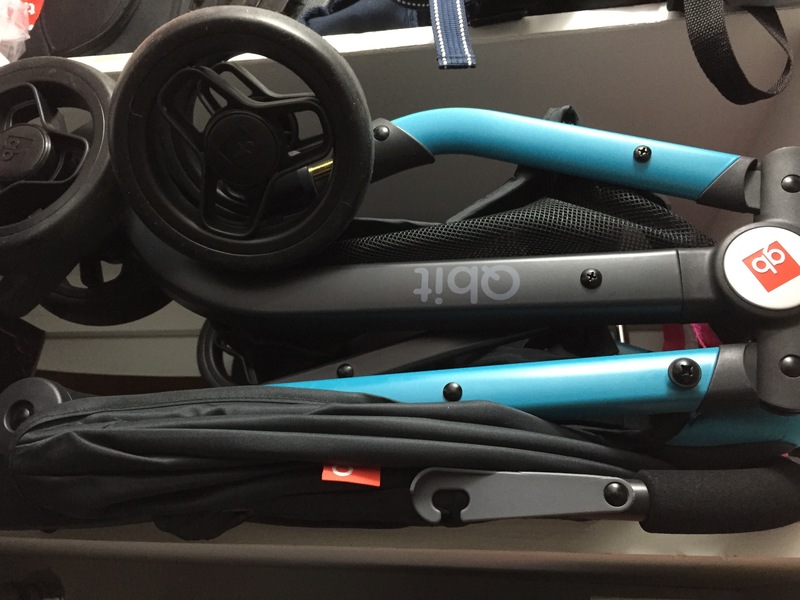 You have to get creative in finding space for the every day stroller that can navigate through the snowy winters as well as the light-weight stroller that’s easy to take up and down the subway steps. It can be tough. The GB Qbit is easy to fold, one-handed, and is compact. It fits easily on my closet shelf, leaving floor space, something that is very important in apartment living. 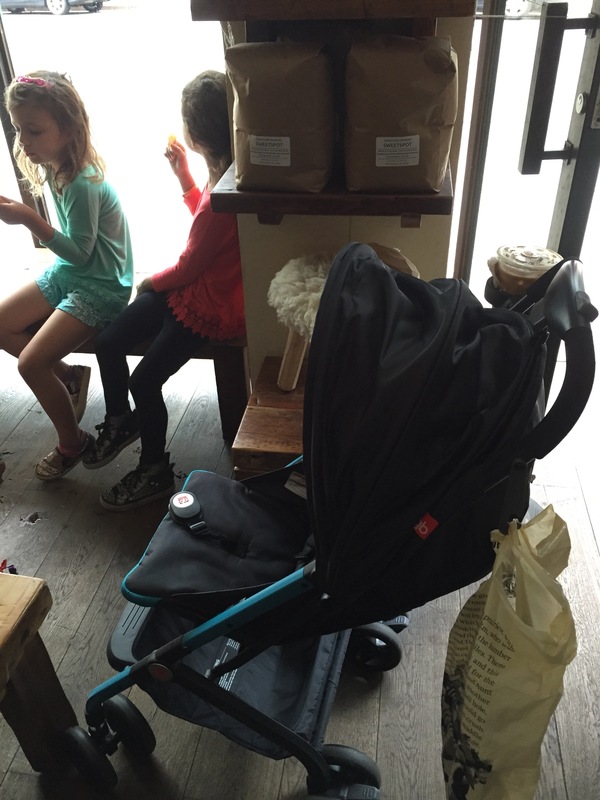 I also found the stroller to be ideal for traveling. For navigating the subway stairs, it’s light-weight, only weighing 14 pounds. 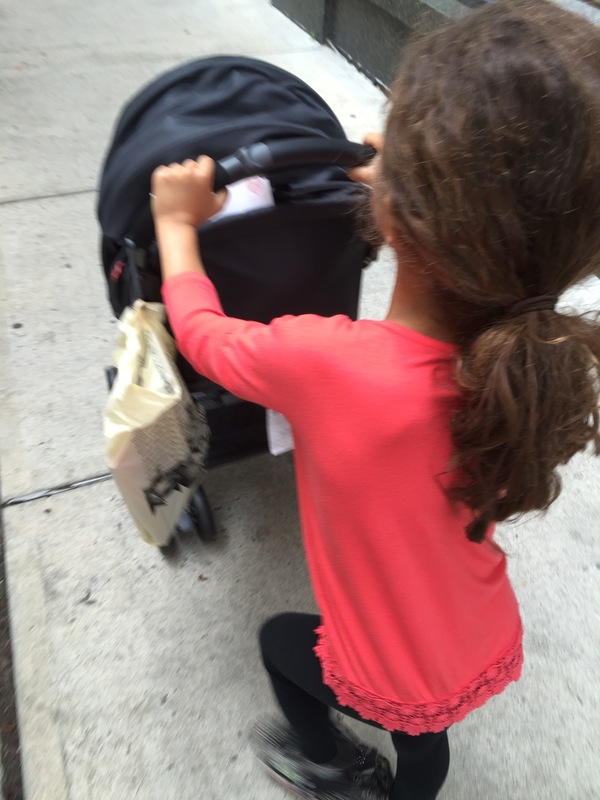 There is a built in carrying bag, perfect for protecting the stroller when traveling by air. It also fits easily in the back of our car. Under basket for diaper bags, toys, or groceries home. Affordable compared to many strollers, $179.99 at Toys R Us and Babies R Us. Infant Car Seat compatible with GB Asana35, Maxi cosi Mico AP, and Cybex Aton. So far the stroller has been fabulous. My daughter loves it. I am interested to see how it holds up navigating the streets of NYC or traveling during the winter months. I will definitely keep you posted. 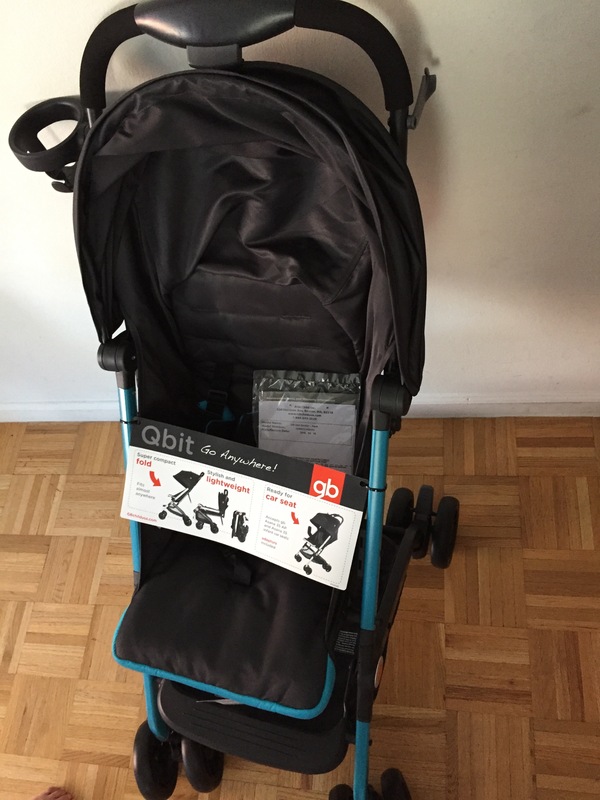 Thank you for the opportunity to share our experiences with the GB Qbit Stroller. I received a stroller as part of the review. 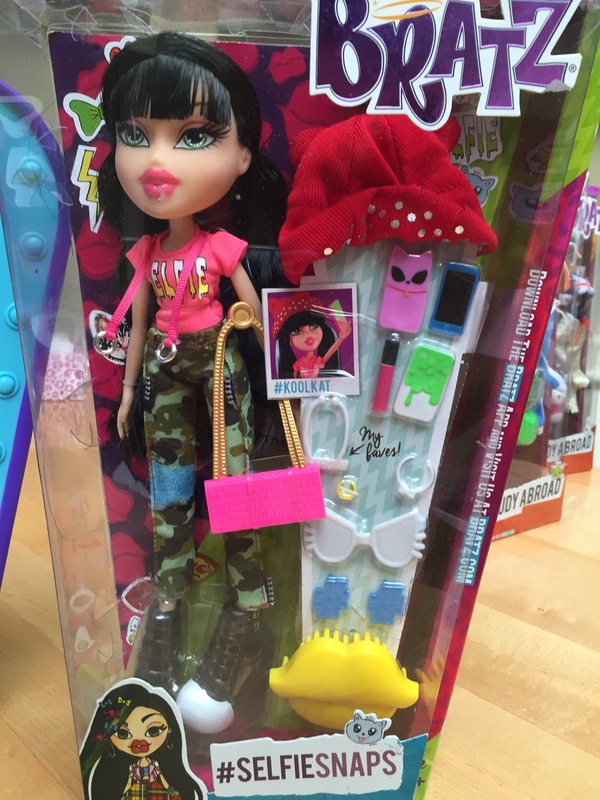 On July 25, Bratz will re-launch their line of dolls, encouraging self-expression, individuality, confidence, and creativity. 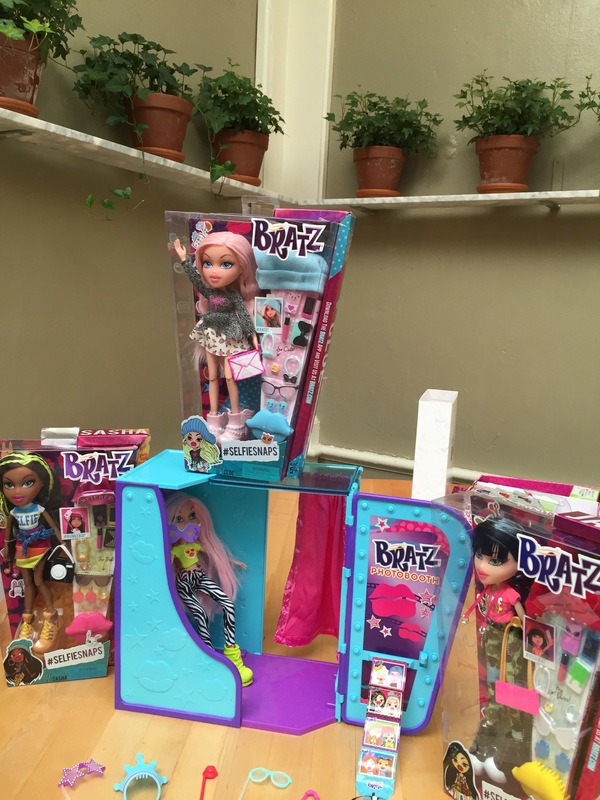 The new line of dolls will feature interests, passions and personalities that will target the “modern girl. This will include reaching the digital generation with a new app and webisodes (to launch Monday, July 27). The #SelfieSnaps collection features dolls ready to snap a shot. Each doll comes with accessories, a cell phone, and two cases. This collection immediately caught my girls’ eyes because the LOVE taking selfies. A photo booth will be sold separately. 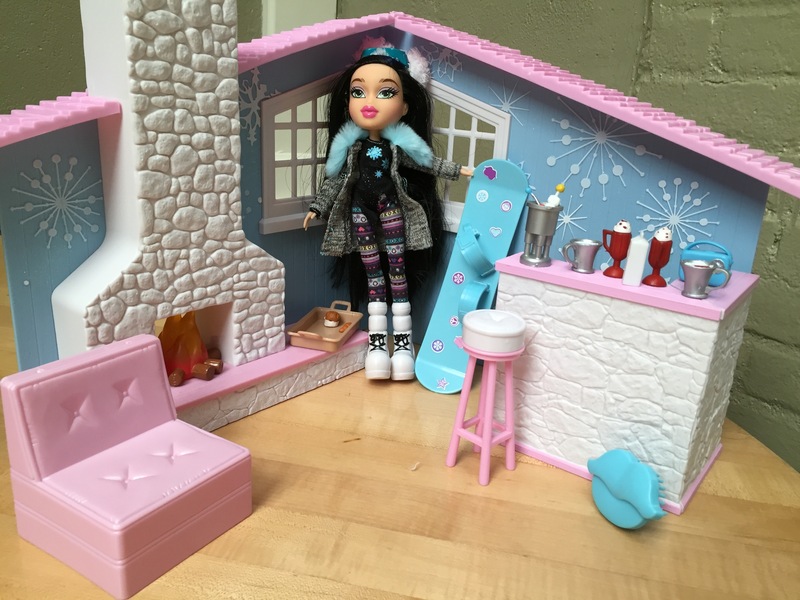 It includes props and an area designed for an actual smartphone for girls to take selfies of their dolls. 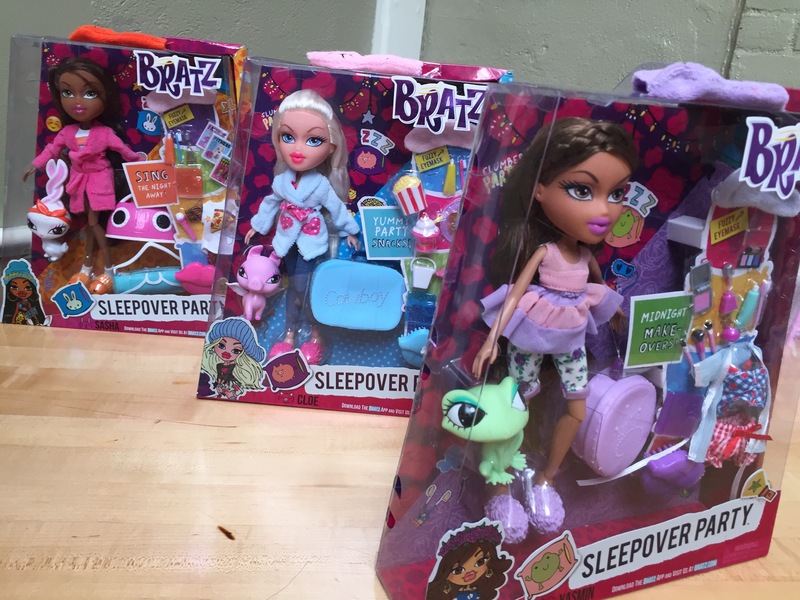 The Sleepover Party collection dolls will come dressed in their pajamas inspired by their individual personalities, sleepover accessories from animals to their favorite sleepover snack. It’s super cute and looks like lots of fun. 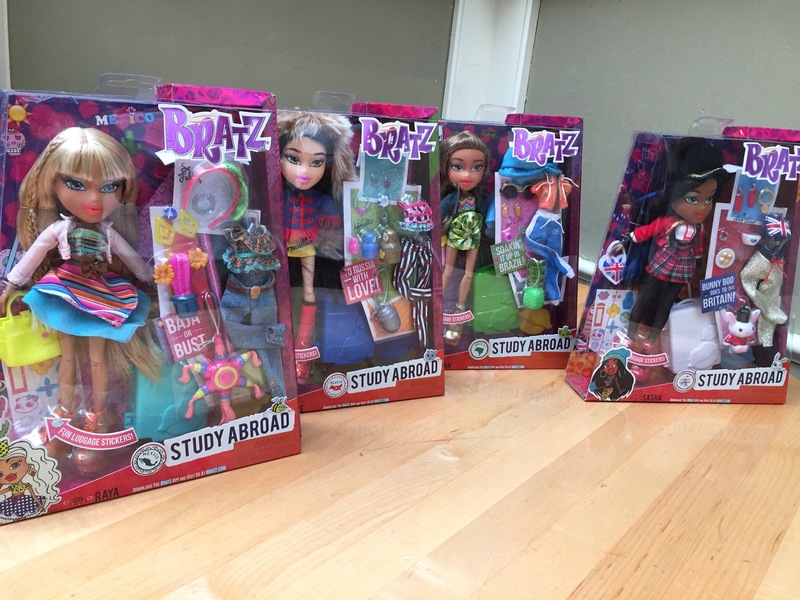 Study Abroad takes the Bratz all over the world. Each doll is outfitted to adopt the cultures traditional fashions and styles into their wardrobe. 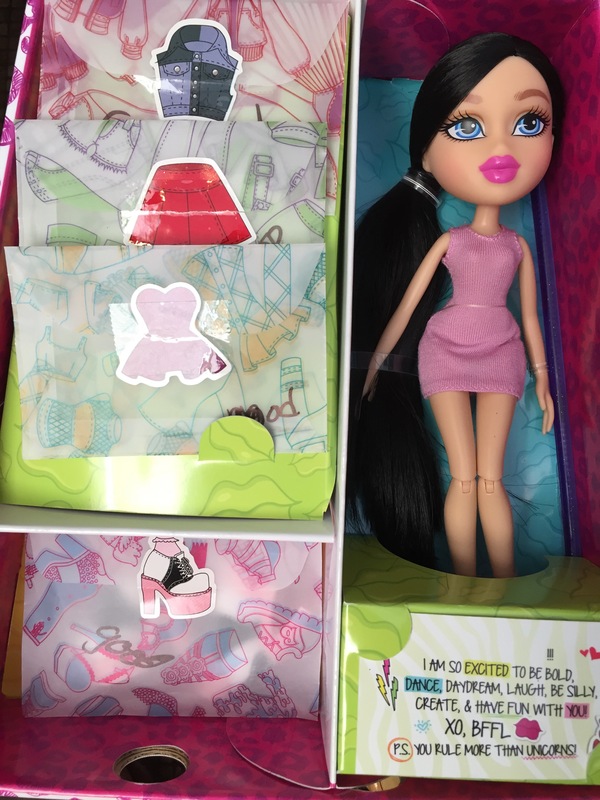 The Fierce Fitness collection showcases the Bratz healthy hobbies in a fashionable and fun way. #SnowKissed and ready to hit the slopes. 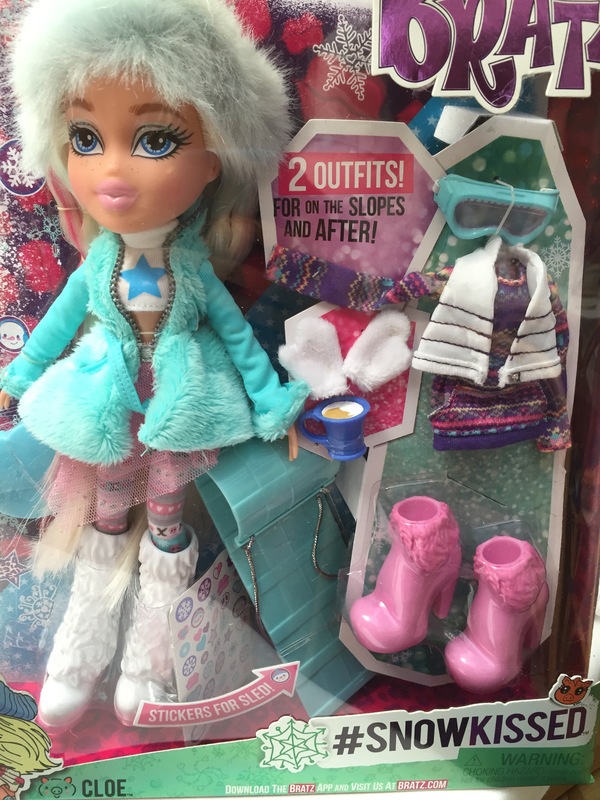 The dolls in this collection feature an outfit to hit the slopes and another for after. Skis or a snowboard will come with the doll. An adorable Lodge will be sold separately. 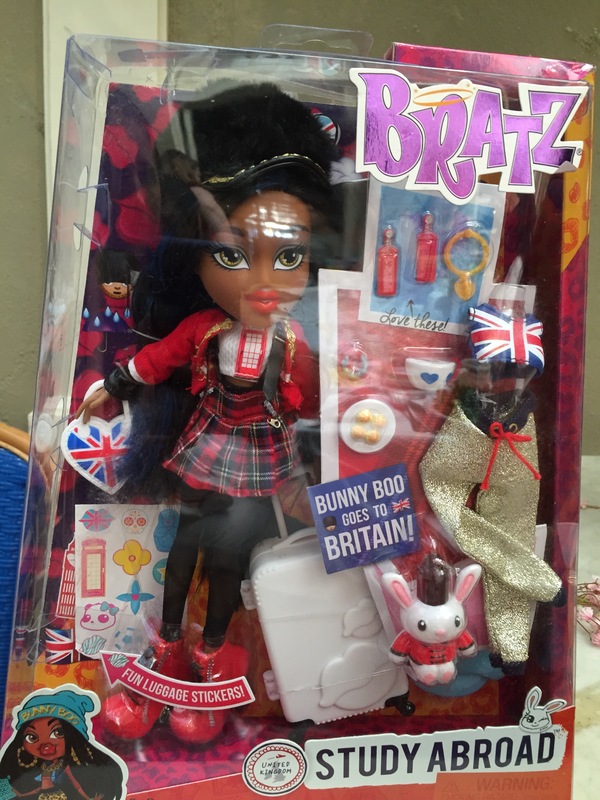 The Creative Bratz collection will also be available. Girls can use their creativity to design an outfit for their doll. The Create-It-Yourself Set, sold separately, includes a rotating platform and mannequin to help your design create their masterpiece. 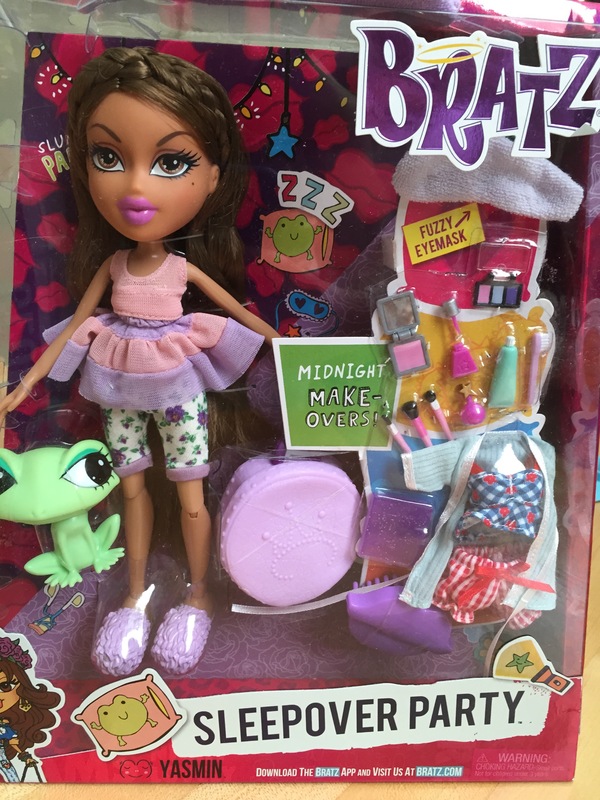 The Bratz Collections will be available at Toys R Us, Walmart, & Target starting July 25. Some lines will be exclusive to select stores. Disclaimer: Thank you to Connect PR for a wonderful preview. I received a gift card for attending the event. Some information was from the event while some came from a press release. As always all opinions are my own.